It seems as though we all have that sad chair, the one that has not been sat in for years and is just hanging out in the garage or attic. Perhaps it is outdated, or the cushion is stained. Perhaps the paint is peeling or it was never painted at all. Whatever the case may be, you don’t have to toss that chair just yet. Instead, why not breathe new life into it? In just a few short hours and at minimal cost, you too can repurpose that old chair into something chic and fabulous. 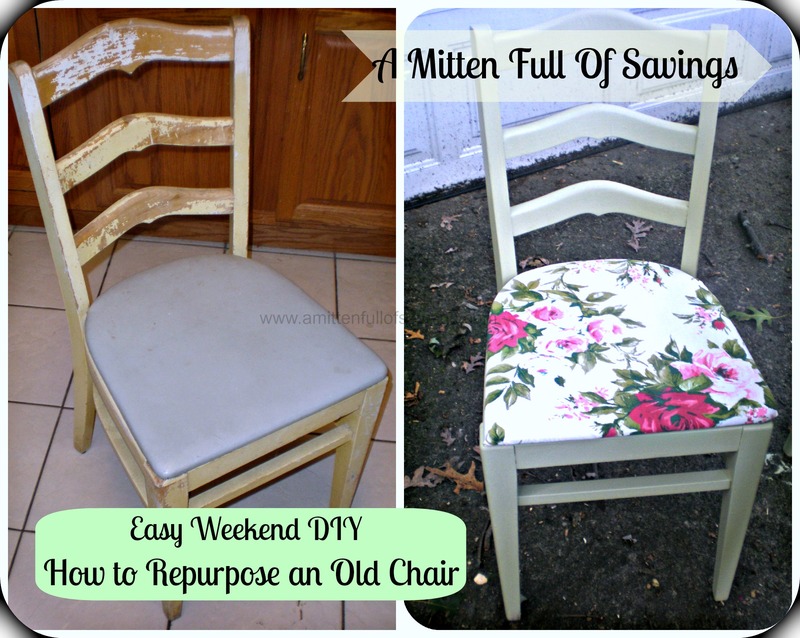 Below, you will find out how to repurpose an old chair, a simple project you can do this weekend if you want! Why would you want to do this? A recent trip to a home décor store revealed decorative chairs were as much as $80.00 a piece. For about 10% of that cost, you can create your very own at home. Just think of how many other items for your home you can purchase with the cash you save. Let’s take a look at how easy this project is. * Paint of your choice. Spray or roll on is fine. Should you need to buy any of these supplies, you can head to your local Hobby Lobby or Michael’s, hardware store or retail store. Don’t forget if you patronize one of the first two stores you can print a 40% off coupon online and save on your purchase. Now, let’s get started! Roll up your sleeves, gather your supplies, and let’s go! 1. First, take a damp cloth and wash your chair. Remove any debris, dirt, tape, markings, etc. 2. Next, use your screwdriver and remove the seat cushion. This is so simple. Just remove the four screws under the chair. 3. Once your chair is clean, you can lightly buff with sandpaper to help the paint stick well. 4. Begin painting, either spraying or rolling on the color. Apply two coats and allow to dry well. 5. Take your fabric and wrap it around the cushion tightly. Secure in place with staples which you will place underneath the cushion. Smooth out well. 6. Once your chair is dry, place the cushion back on and secure the screws back into place. That’s it! You now have a chic and functional chair that will look and feel like new! Turning trash into treasure has never been easier. Once you make over one chair, chances are you will want to do another. Why not experiment with a variety of colors and fabrics? This is the perfect way to get a custom chair to match your home for less. Next post Get Ready For Monsters University- How To Make Your Own Monsters University ID! Previous post New Monsters University Trailers!! Plus How You Can Get A Free Movie Ticket!